Even though this little country can fit into the state of Texas approximately 13 times (read: it’s pretty small), Costa Rica’s reputation for producing some of the best coffee in the world far exceeds its borders. Costa Rica boasts eight coffee growing regions, the most famous of which is Tarrazú. Known worldwide for its fine-quality beans and breathtaking views, this coffee gold mine is conveniently located right in our own backyard. 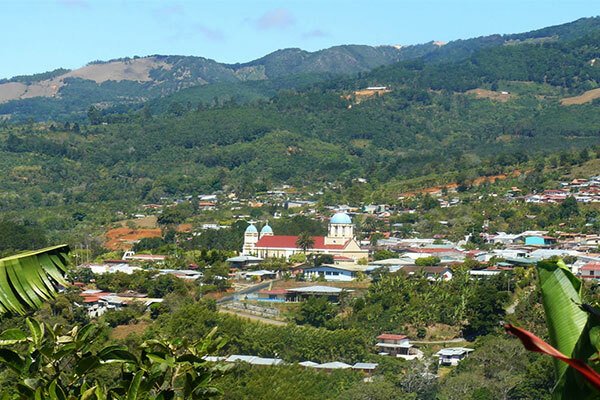 Correctly pronounced “Tar-ah-zoo”, the Tarrazú growing region of Costa Rica is known locally as “Los Santos” because of its cantons (similar to towns) that are named after various saints. About a two-hour drive from San Jose, Tarrazú is filled with roads and coffee plantations that wind around the mountainside. The area is lush with vegetation, and a large number of tropical birds call Los Santos home. The climate of Tarrazú is split into two well-defined seasons, rainy and dry. 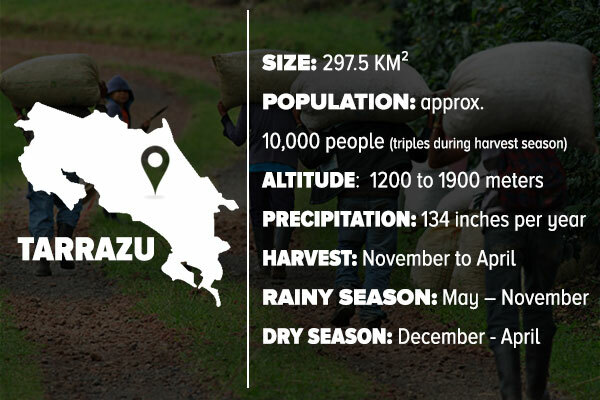 The rainy season lasts for seven months (May to November) during which time the coffee plants are growing and the dry season is from December to April. Harvest time is a five month period from November to March that coincides nicely with dry season. This well-defined climate pattern is ideal for growing coffee and results in high-quality coffee cherries that are uniform in ripeness. 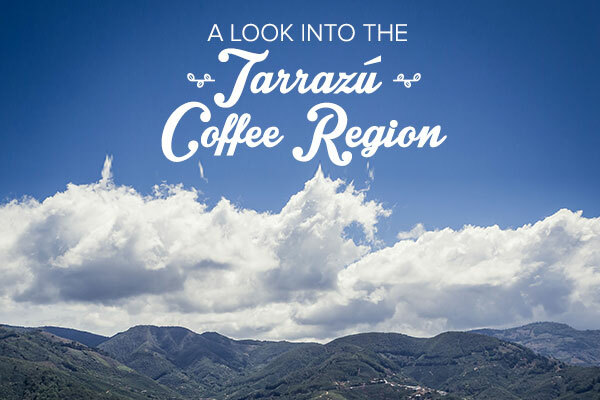 Tarrazú presents an ideal location for growing Arabica coffee beans. 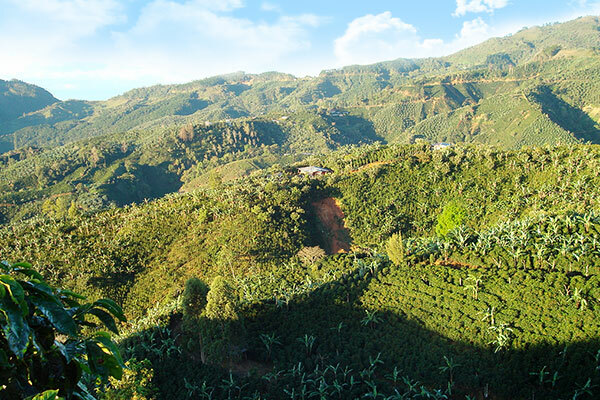 The region is known for producing coffees that have distinctly acidic qualities, mainly due to the sedimentary soil composition that characterize the land. Spanning altitudes from 1,200 to 1,900 meters, the majority of plantations are shaded with a mix of foreign and native trees. 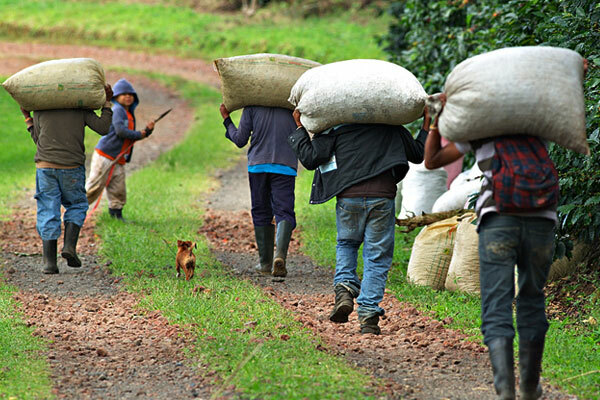 The main source of income for the local economy is the cultivation and export of the coffee, making coffee growth essential to the socioeconomic success of area. This can be seen most when during harvesting season, the population of Los Santos nearly triples. Los Santos is made up of a number small farms, each with an average size of 2.5 hectares (6.1775 acres). All together, the region is approximately 22,000 hectares (54,362 acres) and cultivates an average of 780,000 fanegas (Spanish ‘bushels’) per year. The primary types of beans grown in the region are Caturra and Catuai. Caturra is a mutation of the Bourbon variety of Arabica coffee. It matures more quickly than most coffee plants and is disease resistant. Catuai is a highly productive breed of Caturra and Mundo Nova. It is a robust plant that can withstand heavy wind and rains. Both varieties are rich in flavor and produce some of the highest quality coffee beans. In Costa Rica, the grade of coffee is determined by the hardness of the bean, a factor which is dictated by the altitude at which the beans are grown. The highest grade coffee is labeled Strictly Hard Bean or SHB and is reserved for coffee grown above 3,900 feet (approx. 1,200 meters). It is estimated that nearly 95% of beans grown in the Tarrazu region fall under the SHB category. Our Tarrazú Montecielo coffee uses a blend of beans from plantations throughout the region, offering a sampling of the best flavors Los Santos has to offer. 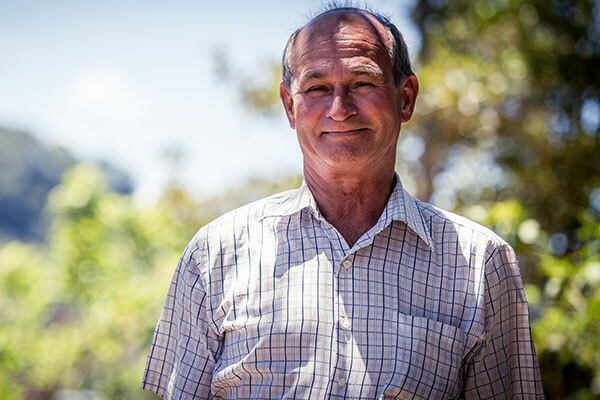 We work exclusively with certain growers in the area, and have done so for many years. These long-lasting relationships ensure that we’re getting the best beans every time. 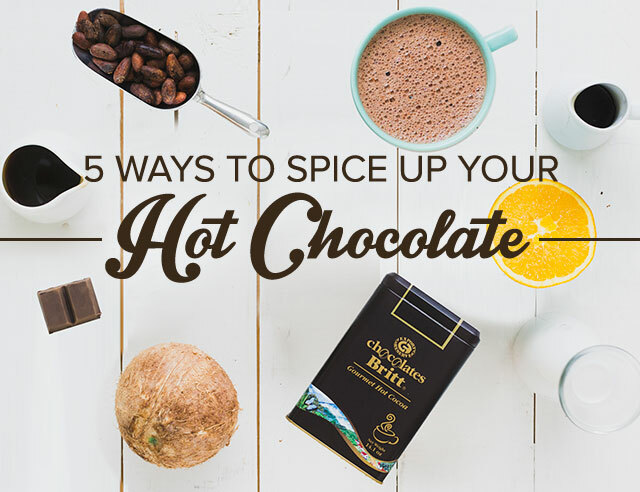 In a cup of our Tarrazú, you will experience a myriad number of flavors, however we’ve all agreed that dark chocolate (cacao) and grapefruit are the most notable. When you open a bag of our Tarrazú beans for the first time, your senses are likely to be greeted with the pleasing aroma of aged wood and dark chocolate. We take pride in the fact that we roast our beans so close to home, and for us, that guarantees optimum quality and freshness for you. 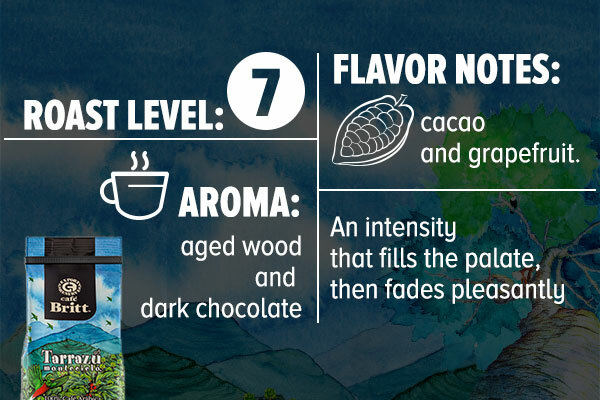 Have you visited Tarrazú or are you interested in trying one of our most popular blends? 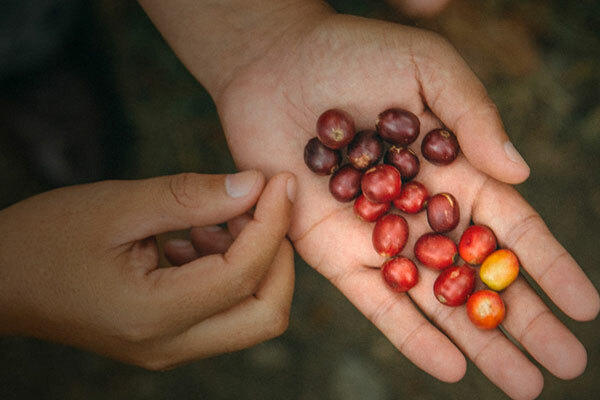 Tell us about your experience with Costa Rican coffee and then pop over to our Tarrazú Montecielo page to read more about the blend and order yourself a bag. Let us know if you can smell the dark chocolate and taste the subtle notes of grapefruit.